Today, you’re going to learn about how you can build equities with your prospects and clients as well as how you can make sure you’re able to best utilize and optimize them. 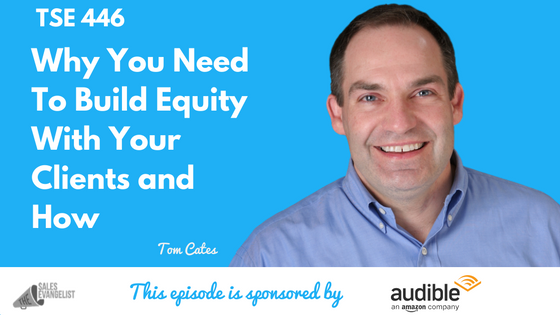 We have Tom Cates on the show today as he delivers some valuable insights into leveraging equity in your own sales process. It’s not just about the numbers, relationship is key. 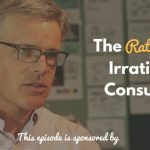 Tom Cates is the Founder of The Brookeside Group, a 15-year consultancy firm that helps people be the best B2B salespeople. A year and a half ago, they built salesEQUITY, a software company that offers resources to small business all the way up to Fortune 1000 companies. Understand what it means to be differentiated in the marketplace today. Actually, you’re not only competing with your direct competitors but you’re also competing with everybody your client bumps into. Equity is what’s left out over. When you’re equally great, you’re all equally average. Nobody is going to pay you more for having a great brand when your competitors have a great brand. *Both product and brand have been so commoditized that it’s so hard to differentiate on these aspects. Most of the time, people do business with people they like. How can you measure that relationship aspect? This is where sales equity comes in. How much equity are you creating by being the salesperson or account manager or the people in the deal? Who are the people involved in the deal? Most often, we find ourselves at the average with everybody else. In every industry, there is a standard of competition. Most salespeople are around that average. So you need to get your buyers to care. 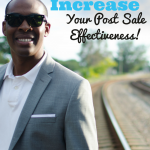 Does your buyer believe you’re reliable, dependable, and you’re going to do what you promised? Does your buyer believe you have the people, the skills, the products, the know-how, the experience to do what you’re promised? *These two dimensions are called “satisfiers” which are not going to cut because these form part of a transactional relationship. Have you done something to make that buyer think you care about them as an individual and that you care about their business or you just treat them like a number? Don’t forget there is a human being on the other side of that desk. Does the buyer believe you’re looking out for their best interest and you’re bringing new ideas to the table? Make sure they don’t encounter surprise down the line. Do you like working together? Do you enjoy and communicate well? Are you clicking? Invest first in the relationship. If you want your customers to trust you, somebody has to go first and you can do that by investing in the relationship. Understand their company and the politics of it. Understand their industry. Also, understand the individual person. You have to put in the time. Many companies focus on new acquisition first, then cross-selling to the existing clients, and retention last. What you need to do is reverse this and instead, focus on retention first, then cross-sell, and worry about new acquisitions last. For most companies, growing organically is a much easier and more profitable way to go. Know your math when it comes to your retention rate. If you have 80% client retention rate, you lose 20% of your clients every year. Say, your average client sticks around for 5 years. Improve that to 90% rate by changing your average client from 5 to 10 years. If you go from 90-95%, go to 20 years. If you go from 95-95%, go to 25 years. That 1% from 95-96, add it 5 additional years of average buying from your clients. You’re actually just getting started when you’re in the low 90’s. Invest in the relationship. Understand your buyer. Demonstrate those 6 dimensions of relationship and then you begin to grow. Connect with Rom through email at tcates@salesequity.com or visit www.salesequity.com to know more about their products and services as well as some valuable resources related to the 6 dimensions of relationship. Find out your blind spots and how you can get ahead of the pack. Tom is also on Twitter and LinkedIn.